No sew pillow covers are an easy, affordable way to spice up your decor. Choose your pillow, choose your fabric, and voila! You have a fresh new look. Home decor sites and magazines are always brimming with beautiful displays of living spaces adorned with furniture, lighting, and wall art – pristinely arranged with a specific color palette and theme. I am deeply inspired by these ideas…and then I take a look around my living room. While I’m realistic enough to know that my busy life full of kids, dogs, and hectic schedules does not facilitate a formal (or immaculately clean) living area, I would love to spice up my space a bit. Unfortunately though, new furniture and a decoration overhaul are way out of my reach at the moment. Then, a light bulb went off. What is something that almost all of these home decor publications have in common when showcasing their designs? Perfectly placed decorative pillows! Now, this is something I can get on board with. So, I started shopping around for some brightly colored, patterned throw pillows to add a little pizzazz and a fresh look to my old (uh, I mean vintage) furniture. My search quickly turned into sticker shock. I couldn’t believe how much money stores were charging for these simple items! I could practically make them myself. Wait……could I make them myself? Turns out I could, and I did with just a few items and a pretty short amount of time. If you don’t have a sewing machine, don’t worry – you won’t need it! These DIY no-sew pillow covers are a great way to add little decorative accents to your home without breaking the bank. Lay the cloth with the back side up on a clean, flat surface. Gauge how much fabric you will need. It should at least cover the whole pillow. Set a few inches of allowance around the cloth. Cut excess cloth and iron it so it will be free of wrinkles. Starting with one side, put double sided tape along the edge. Peel off the cover of the tape to expose the other sticky side. Fold it down. You have just created a hem! Next, iron that area so it the fold is neat. Repeat the previous steps to the rest of the sides. Put your pillow in the middle and fold the sides of the cloth toward the center. Then carefully pull the pillow out, making sure you don’t move the flaps as you do so. You can also put markers to indicate the exact spot. Tape the bottom side to close that opening. Do the same thing to the top portion. The flap at the center should remain open in order to insert the pillow later. Reverse the pillowcase. The doubles sided tape is strong enough to keep the hems and the sides in place, but you still need to be careful. Then, stuff your chosen pillow inside the case. If you want a cleaner look, you can adhere tape to seal the flaps. Close it and use your new and improved pillow as you so desire. Now that you know how easy it is to spruce up your pillow collection, it’s time to really get creative. Experiment with colors and patterns. Many fabric stores have discount fabrics for a fraction of the cost. Or you can recycle fabrics from an old dress, sheet, or blanket. Sometimes you can even find some fabulous fabrics at thrift stores. Just remember to always wash all fabrics (new or old) before starting the project. One of the best parts of no sew pillow covers is you can use them for any room in the house. Want to add a pop of color to your bedroom set? Or mix a few animal prints into your couch cushions? Maybe you have a window seat that could use some extra cushion or color? The possibilities are endless. Take inspiration from the decoration experts in magazines, but make it your own. 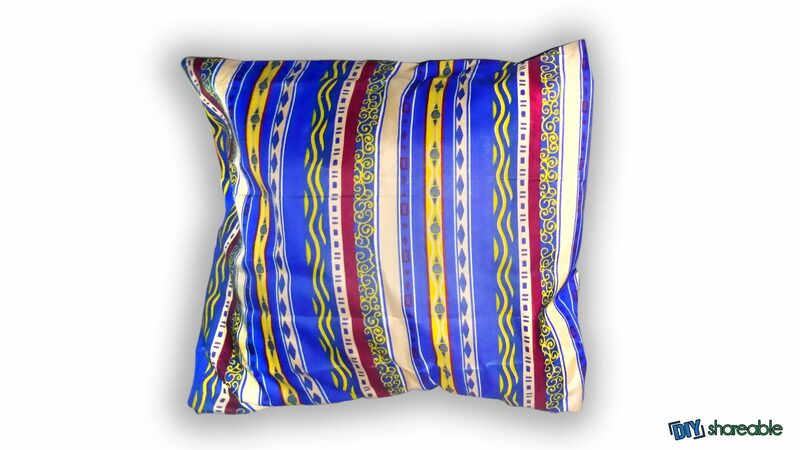 How have accent pillows enhanced your home?